My hummingbirds on the Secret Garden embroidery project are not going to be remotely realistic looking. I just thought I would clarify that before I go any further! 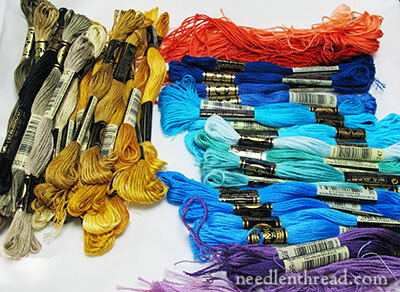 Instead of pulling out floss in just a couple shades in a color family, or just one color family for a particular part of the design, I usually pull any floss that strikes me as somewhat similar to the color, and then I pull as many shades in that color family as I can find, from as dark as possible to as light as possible. Then, I look for some compatible colors that work with this first bout of selecting threads, but that I didn’t necessarily work into the colored design – just in case I missed something that might work better! Then, I eliminate a lot of the complimentary colors, keeping just one or two that seem to work best. And at that point, I generally end up with a whole heap of threads, most of which I won’t actually use in the project. The colors on the left are not necessarily in the line-up. I picked out some neutrals because I want some neutrals in there, but I also picked out a range of yellow-golds, because I want some yellow-golds in there. These blues in the foreground weren’t an initial choice – they were a peripheral choice. They are super bright. I like them, but I don’t know if I like them for this. And I’m missing darker shades of that green in there – I pulled that greenish blue for a highlight, not necessarily a base color. I want a dark green that will compliment it, but I can’t seem to find one in DMC that I like. This may necessitate a shopping trip. Now, my next step is just to start stitching, to see if the ideas in my head and on paper will work out with needle and thread in the colors that I’ve pulled. As I work with them, I’ll make note of what colors I actually use and where I use them, along with what stitch and how many threads. That way, when I write about the hummingbirds and show you what I’m doing, I can tell you what colors I’m using with what stitch, where. Another reason my hummingbirds are not going to look too realistic is my stitch selection. The birds are not going to be worked in a realistic needle painted approach. There’s a lot of scope on the birds for some stitch fun, and – at least in my mind right now – I’m hoping to incorporate some variety into the birds. BUT – and this is a mighty big but – I’m really not going to make any decisions that are set in stone until I start stitching and discover what I like and don’t like. And once I start stitching on the birds, who knows? 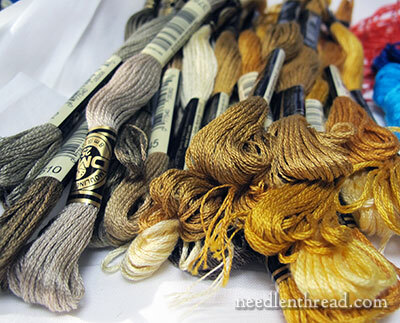 I might chuck it all – from colors to stitch ideas – and go in a completely different direction! And that is pretty much how I tend to work. I’ll be dabbling with the birds this week and sharing the process as I go along. We’ll discover together what we like or don’t like. I may like some things that you may not like. And you may like some things that I don’t like. There might be a little un-stitching along the way – but then again, there may not be! It’s an adventure! Hang in there with me, and we’ll see where it ends up! Do feel free to add input! I had just about decided to go with blue and gold for my birds, but I am leaning more towards bright colors, almost electric in effect. I find I am more attracted to bright colors, I suspect it’s because of my environment – Florida! LOL! Mary, any time you need some fun in the sand and sun, come on down! I am VERY new to embroidering and I love this site too. I was recently introduced to both by my quilting buddy. Are you by chance near CR 220 and Hwy 17? I would love to see (admire I am sure) some of your projects. The only things I have done with this project: bought the book and read some of the stitch tutorials. I am also a new resident of Middleburg. I am hang in there with you!. Well,this will be interesting. I can’t wait to see what you do. I am a realistic kind of gal, so now I wonder what I would do at this point. If I were going to do realistic, how would that effect the choice of color for the rest of the piece? I can ask that since I haven’t started yet. I really want to stitch this, though. Since I would want the birds to be the dominant element, how would I go about picking leaf and flower colors? This isn’t a comment on the hummingbird colors or other projects you have in the works. I just have to share with you a gift I received for my 75th birthday last weekend. We were in Denver. The three brothers went to baseball and we three wives didn’t! We went antiquing instead. At the antique mall I always look for stitchery items that speak to me…or call my name….you know that magnetic draw that happens when you are confronted with handmade items. On Thursday morning I spotted a cut-work tablecloth that took my breath away. I quickly filed it in my “lovely to look at” compartment. I told myself that I had more than I needed and at my advancing age, why should I buy more!?! We left the mall after a few hours and I said to myself, “I’ll come back in a couple of days to take a closer look to see how much mending it would require.” Unbeknownst to me, my sisters-in-law scurried over there on Friday during my nap time and bought it for my birthday gift. Friday night after a very nice meal out, they presented me with this bag. In it was the tablecloth. I was awestruck to say the least. I have since returned to Minnesota. One of the first things I did was to put the tablecloth on my dining room table. It looks beautiful there. Now, do you want to see a picture of it? Can I attach it to this email? I don’t think so. It is almost entirely pulled thread embroidery. Very little fabric left. I know how busy you are…and I won’t be offended if you don’t have any time to look at it. Just say yes or no. I can hardly wait to take it to my stitchery group on Thursday night!!! Thanks, Mary. You are amazing!Karen Olson from MN. Hi, Karen! I’d love to see it – you can email a photo to me via reply. This comment that I’m writing right now will show up on the website, but it should also show up in your email. If it doesn’t, my email address is mary (at) needlenthread (dot) com. What a lovely birthday surprise! I’m sure it made the day extra special! Share it with all of us. Would love to share in your birthday excitement. Love your colors for the hummingbird. Kismet, as they say, because I just saw a wonderful macro photo of a hummingbird online by Chris Morgan. I had no idea of the complexities of color in their feathers – amazing. Would love to share the picture with you. Close-up, he looks more like a peacock! No matter what your technique for choosing colors is, your results are always gorgeous! Looking forward to watching your adventure, Mary! How about some sparkle in silver and gold? I for one am taking the more non-realistic approach. I have chosen some stitches that I have not used before with non-traditional colors choices. The past week I have not done much stitching at all which makes me sad and a little panicky. LOL Mary! i am starting on a major needlepoint project (only the second one in 35 years or so) a piano bench cover and had a design picked out. I had a general color scheme; basically a peacock color scheme. I had pictures of designer rooms that i liked and even a printout of the peacock color ranges from pinterest when I went to A Stitch Above. Dawn started pulling color familys for me. before we knew it there was a VERY large heap of yarns on the table. so i took a leaf out of your book and started eliminating what i didn’t like. the design called for nine colors so i ended up picking out 16 colors that i really liked. i bought my canvas but didn’t buy any yarn because i have a small needlepoint project going and it’s at the really boring stage, nothing but background, so i knew that if bought yarn for the “next” project i’d stop working on the current one which only lacks a couple of weeks of work to finish it so i’m being STRONG. but, and there’s that but you’re so fond of…lol…this morning i was working on my small project and decided that i wanted to elaborate on that design for the piano bench cover instead of the original design i’d picked. since the new design only calls for seven colors i’ll be doing a “floss toss” next time i go to A Stitch Above and trying to whittle it down to the colors i need to decide on. i did decide on the background color though so that makes my job a little easier, only having to pick six out of 16. wish me luck! Thanks for sharing that method Mary you’ve helped me over yet another hurdle. Yes it is so difficult getting going! I had a thought though, when you do finally get them done it would be nice to see what other people have done too. So seeing how differently various people do it. Unfortunately I am not joining you on this one as we are on an economy drive and so I cannot have the book but I am doing the passion flowers off your collection! I just LOVE reading about your thought process as you approach a project…especially the way you let you mind roll over ALL the possibilities! Late today just got back from a days clothes shopping for my holiday in Turkey in September, just missed the sales they start tomorrow “sigh”, anyway back to needlework I do like your approach to your colour choice of thread now I know why your embroidery is always perfect. I think a lot about the colours before I start stitching but I’m afraid I go with the moment, I don’t test I just think oh that will go nice and proceed without a trial stitching sometimes it works sometimes it doesn’t. I can’t wait for the fun stitches and how you will play around and approach the Humming birds exciting stuff, thanks for sharing your thoughts on thread choice with us. By the way I bought some lovely clothes well worth the trip to Brent Cross Shopping Centre. The colors of the leaves and flowers are vibrant and beautiful in the Hummingbird Project. I had a thought about doing the birds in whitework, with some slight embellishment. I don’t know if you will fill in the places between the feathers or not, but a pale silvery thread (Kreinik blending-type thread or something similar) could be used to define the lines, and maybe a light grey for shading? I think that another vibrant color on the birds would possibly fight with the floral edging, so this was my thinking to make them stand out, a complete contrast. Thank you for all your postings, my favorite blog! It’s absolutely fascinating to read about your thought process. I love your train of thought approach to this decision and will be anticipating your next step in the process. Most of all, thanks for sharing. You are so amazingly visual. Reading your words is like sitting with you watching your creativity unfold. You stimulate me to experiment more with styles and color complexities. You are always helping us stretch and grow. This beautiful design is a wonderful course and I am learning so much. I was really hoping you would lean towards the stylistic art work. Mary, I also choose brilliant turquoise plus some electric and royal blue almost purple shades — plus whites and taupes and a sparkly white, for the breast maybe. This was based on pictures I saw of actual birds. I want my two to be different. Definitely not a gay couple here. I’m volunteering in wildlife rehab. The other evening a resident hummingbird got out of her cage and went whirling around the office — so joyful! She was only mud color. All the fun was in her joyful flight. It would be helpful if you could include the numbers when you show skeins of thread; not everyone has a huge stash of threads from which to draw, and getting to one’s local store, for me, is twenty miles each way! 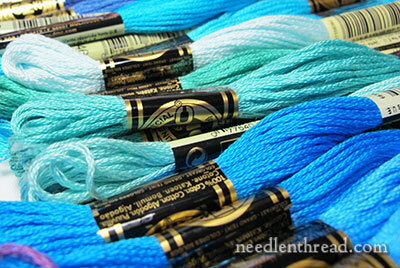 The turquoise/purples have given me an idea for a different project that has been on the back burner for some time. I’ll eventually list the colors I use. I figure sharing 50+ color numbers right now for people to go buy, when, in the long run, I’ll probably only use 10 or 12, would be wasteful. As I work, I’ll share the color numbers and stitches with you. Having looked through your archives I didn’t see anything posted regarding Sulky thread “Cotton Petites”. I’m curious if you or your readers have ever tried it? It’s marketed at 1 strand being equal to about two strands of regular cotton embroidery floss. The benefit appears to be that it’s packaged on a spool similar to the Au Ver products. Any comments? I am amazed at your thought process… It seems I start that way but end up using little to none of my first ideas. Thank goodness for a big stash! Can’t wait to see how the birds turn out! Thank you Mary, I get so stuck on colours more often than not they end up in the ufo pile which is increasing. Now you have shown me a new process to try I will get some of them out. A friend of mine posted a link to this web site on FB. I thought you’d need to see it, if you haven’t already. Yes, I’ve seen it quite a few times! It’s an incredible picture – I love the close up on the head! I found it interesting how much the feathers look like scales. I wonder is that true of most hummingbirds? Hey! At last I can identify with a professional embroiderer, as your colour choice method is more or less how I go, too. Light sources make so much difference, and you really need a good block of a colour to visualize it in the design. Look forward to watching it grow! Thanks for all your inspiration – especially the part about practicing new stitches before you use them in a project. Builds skill and confidence, both of which I need! your color selection method reminds me of cooking – take out the spices that might work, open & sniff. Some go back in the rack, some into the pot. And sometimes you try just a pinch of something that you are debating on. BTW I don’t think there’s anything remotely fickle about changing a design as you’re working on it. It’s simply part of the developmental process. If it were to be a commercial design to be repeated, you’d probably have one or two prototypes which had been changed and re-worked a number of times. With a one-off piece, it’s tempting to think that the basic design we settle for *Should* be the final one, no deviations, but that’s not really realistic and doesn’t allow for personal and artistic development. It was fun to read how you make your initial colour selections, particularly after I spent nearly an hour today waffling about whether or not to include something in my current piece of crazy quilting. I should learn that when I’m waffling it generally means my subconscious is telling me not to go there. You are not being fickle; you are being a creative woman. As an artist, you have the right to change the color or the stitches as you wish. As a woman, you can change your mind any time you like, just because you feel like it. I really like the blue greens for the hummingbird! And I am so glad you mentioned the pomegranate corners when you talked about the hummingbird eye – I saved the pattern a long time ago and wondered if you finished it?